Eleanor Roosevelt was never at a loss for words when dispensing wisdom. Her famous “dreams” quote sits majestically near my computer station, a constant reminder that I must believe in my dreams. A wonderful thought, indeed, with subtle complexities. Before you can believe, it seems that you must define the dream within the framework of beauty. Dr. Martin Luther King, Jr. believed in a dream. He defined it with passion and eloquence. The world saw beauty. This entry was posted in Dreams, Eleanor Roosevelt, Jack Kerouac, Martin Luther King, Jr. and tagged Dreams, Eleanor Roosevelt, Jack Kerouac, Martin Luther King, Jr..
Hi Rebecca, what a lovely start to my day, thank you. My favourite Eleanor quote has been the one about being what I am today because of the choices I made yesterday. Still excellent, but I think I’ll borrow yours for a change. You have been missed, but I knew that you were on a grand adventure. Welcome back. Funny how the past continues to influence our future, even though all we have is the present. Which, in the end, means that we really are creating the past and future at the same time. Powerful stuff! I am so happy to have you back! You were missed – enormously! I just wanted to take a moment to tell you that l love your posts. I admire your style. My best wishes for you ! Oh, my dear friend, let us continue our dialogue – there is much to discuss! I find your words a way to my calling and they meet me at the crossroads,when I most need them. 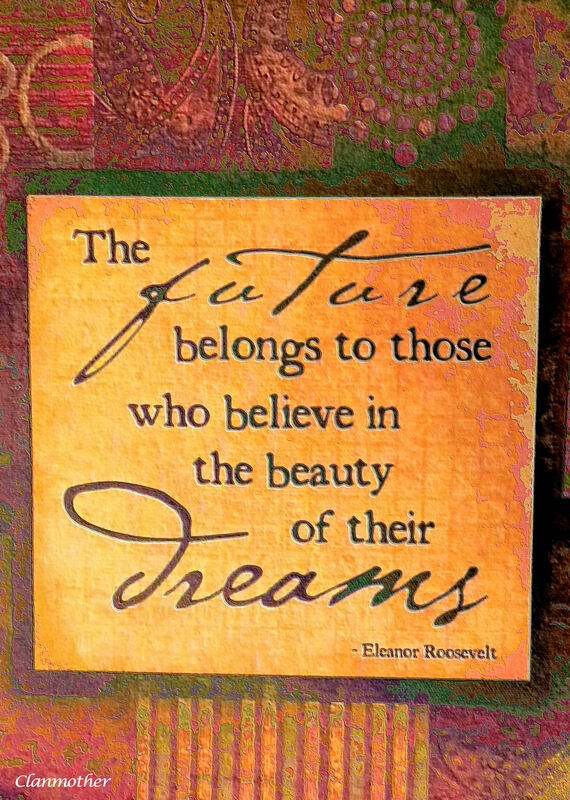 My belief in my dreams wavers and stoops. But, I realize that if I keep on strengthening the base of all the hopes, a little part of the future may have space for me. An insightful thought. You have identified, in my opinion, the heart of the dialogue. We all want to participate to the very best of our abilities within our fragmented and complex global world. The question is how to balance our dreams within the context of our immediate environment. After much thought, I am coming to the realization that seeking to fulfill our personal dreams is a way of giving back to the entire community. I am grateful for your presence and comments. One last thought from Harriet Tubman, who realized her dream against incredible adversity. I love the title *clanmother* and the story behind it. Thank you so much for adding your wisdom to this dialogue. You made perfect sense. I especially liked when you used the iconic circle to illustrate the point that our choices continue to reverberate throughout our lives and ultimately shape our destiny. This post warmed my heart this on this very cold evening – so thank you! You made my day sunshine! And it has been raining in Vancouver for a couple of days – so much so that I thought I saw the animals gathering two by two. I think I’ll look around for the ark! Oh my girl is dreaming this week. How very lovely and what a great way to spend the day. Now to take your kiwi tea and a scone and find a lovely park bench to clear the cobwebs and let the dreams come forth. I am drinking the kiwi tea as I write this comment. The cobwebs are being swept away…there is always time to dream!